The joyous nature of the Purim celebration often carries a serious message behind the smile. The Purim Spiel often takes a look at world politics with various world leaders playing the roles of heroes and villains. By offering a mocking commentary, the Purim Spiel presents a Jewish version of political justice in the world. Despite the relatively minor nature of the festival of Purim, it has assumed far greater proportions and significance in popular Jewish culture. It is often celebrated as if it were a major Jewish holiday. On the surface of it, the events of Purim — recounted in the biblical Book of Esther — are about a near catastrophe in ancient Persia. The Jews, about to be attacked, end up turning the tables on their enemies and end up the victors. Therefore, the date of Purim became an opportunity for celebration of this miraculous turn of events. Early on, the Talmud records that Purim was a date of celebrations and riotous parties. In the Talmudic tractate entitled Megillah (megillah means “scroll,” referring to the scroll of Esther) the ancient Rabbis passed along a longstanding tradition that in order to celebrate the victory of Purim, everyone is supposed to drink alcohol and reach the point where they are unable to differentiate between the phrases “Bless Mordecai” and “Curse Haman”(Megillah 7a). While the dictum of consuming alcohol may not be palatable to everyone today, drinking (at least for the adults!) and merriment remain a traditional aspect of Purim celebrations. Even though Purim is a religious opportunity for young and old to celebrate together, the celebration of Purim has been commonly relegated to a children’s event. Many synagogues today celebrate Purim by holding a Purim fair or carnival. This is an opportunity to set up booths with games, give prizes, and serve holiday foods. And the highlight of any Purim celebration is the Purim Spiel. Spiel is a Yiddish word meaning a “play” or “skit.” A Purim spiel is actually a dramatic presentation of the events outlined in the Book of Esther. Featuring the main characters, such as King Ahasuerus, Mordecai, Esther, and the wicked Haman, the Purim spiel was a folk-inspired custom providing an opportunity for crowds to cheer the heroes (Mordecai and Esther) and boo the villains (Haman). 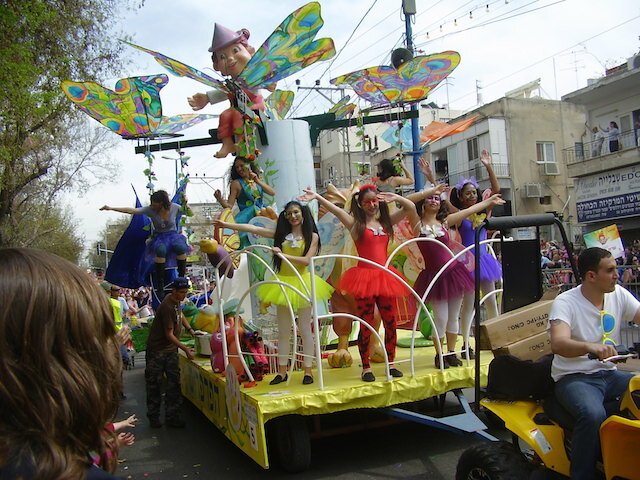 It is a staple of many modern synagogue Purim celebrations for children to attend the ritual chanting of the Book of Esther and Purim carnivals dressed in costumes depicting these main characters. Often, a synagogue religious school will hold a costume contest and organize a parade of all the costumed children. While it is traditional to masquerade as characters from the story of Esther, many Jewish families celebrate Purim as an alternative to Halloween, with children dressing in non-traditional costumes and masks. There is no “right” or “wrong” costume for Purim. In relatively modern times, the popularity of these Purim shpiel plays and the boisterous audience reaction they engendered, spilled over into the actual synagogue celebration of Purim when the scroll of Esther is chanted in Hebrew. There is an ancient tradition derived from the Torah that one is supposed to “blot out” the mention of Haman as a form of enduring spiritual punishment and ignominy for his actions. Therefore, synagogue attendees attempting to “blot out” Haman’s name will literally shout, catcall, boo and swing noisemakers, called graggers, to drown out the name of Haman as it is read. Many synagogues hold special family or children’s services on Purim, or make a point of including families in the chanting of the Book of Esther so that the children will be able to not only attend in costume, but shake their noisemakers and contribute to the merriment through making lots of noise. In fact, a growing custom is to hold an arts-and-crafts session for the children in advance of the Purim festivities so that children can make their own graggers and masks to wear. Purim shpiels have evolved over time into the presentation of humorous skits not just about the story of Purim, but also about leaders and well-known people in the community. In synagogues, members may write and act in funny skits gently mocking the rabbis, cantor, president, and other people. In Jewish religious day schools, no teacher ever escapes the mocking attention of their students in such Purim shpiels. Purim spiels also include popular songs sung with new, creative funny lyrics lampooning community leaders. Some congregations go to elaborate lengths in producing spiels, sometimes writing mini-musical plays, or with some people renting expensive outrageous costumes. It is also traditional for religious leaders to deliver “Purim Torahs,” which are farcical, sometimes nonsensical, sermons about ridiculous topics. Often, the synagogue bulletin for Purim will be a special joke edition with many funny, ludicrous articles. Dr. Jeffrey Rubenstein, a professor of religion at New York University writes that Purim is a holiday characterized by “liminality,” that is, a day in which traditional social boundaries and rules of etiquette are deliberately blurred. Purim is a day for a community to “blow off steam” by celebrating this ancient escape from destruction. Therefore, it is a day of topsy-turvy antics, especially in the Purim shpiel. In addition to drinking more alcohol than usual, well-respected leaders are lampooned, children dress up as adults and, especially in Israel, men often dress up as women and vice versa. It is a day in which society as we know it is turned upside down. But the celebrations of Purim are ultimately for a religious purpose — to celebrate the unseen presence of God who saved the Jewish community in Persia thousands of years ago. While Purim shpiels and graggers may seem to diminish the spiritual importance of the holiday, they are part of an ongoing celebration of good over evil, and a festival celebrating God’s presence in Jewish history. Pronounced: SHPEEL, Origin: Yiddish, literally “play” or “skit.” A Purim shpiel is a humorous and dramatic presentation of the events outlined in the Book of Esther, often performed on Purim eve. Also used to mean story or explanation not necessarily on Purim.